A few days ago I woke up, early in the morning, drenched in sweat. The sheets beneath and above me were soaked through with it, and my blanket too; everything smelled of sweat. My head was spinning, and I managed to push myself upright and take a drink of water. I got up and very slowly shambled into the living room, where my mom lay on the couch with the news on. It was still early enough that there was no light outside. I collapsed into the recliner, and wrapped a blanket around myself, taking staggered breaths. There was a hurricane coming through, Hurricane Michael, but honestly I wasn’t concerned about it. I don’t really mind storms anymore, as an adult I’m not really afraid of dying in them like I was as a kid, and I often find the pounding rain comforting. I sat in the chair, my head lolling back and forth because it was so hard to hold it up, and every time I exhaled, a soft moan would accompany it. This was the second day that I’d been sick, and I still didn’t know what with. But it was terrible, and it was wreaking havoc not just on my body but on my mind and heart as well. I suffered from a constant dread, a feeling that this would never end, never get better. I don’t handle being sick well, and I never have. At least not when it comes to anything stomach related. Throwing up is an incredibly rare occurrence for me, to the point that I’ve always found it incredibly odd to hear people talk so casually about throwing up from drinking, or making themselves throw up to feel better. For me, vomiting is a life-or-death experience, at least emotionally. My entire body goes limp and then seizes up, it’s more like a seizure than throwing up. I never throw up quickly, it churns in my stomach for hours and sometimes even days before it leaves me, like a disease festering inside my body. Usually I can feel a disgusting taste coming up into my throat for days beforehand and when I do throw up, it exhausts me so much physically and emotionally that I almost always cry, and then emotionally collapse and go to sleep, praying that it will be over soon. So, it was with some unease then, that I went to work several days ago with my stomach feeling uneasy. Now, I’m actually used to my stomach giving me problems pretty often: I’m lactose intolerant, I have type 2 diabetes and issues with blood sugar, but usually it never gets bad enough that I throw up, and thankfully at no point in this story do I ever end up throwing up. Thank God for small mercies, I guess. I work at a coffee shop, and had taken home a couple of the “protein boxes” that were past their sell by date, which I’ve even before and which are usually just fine. I happened to take home a couple that have two hard-boiled eggs in them, and though I still don’t know for sure, I think the eggs are the source of all of this. I ate one of the protein boxes the night before, and another the morning of before I went to work that day. I was in and out of the bathroom all afternoon, but I was determined that I wouldn’t leave work early because of it. The truth is, I have a bad problem with calling out of work, or avoiding work in general. I’ve never been good at working a job for the same reason that I was never good at going to school regularly: I don’t like feeling trapped. I can actually still remember the moment in Kindergarten, walking into the school on a dark and rainy morning, so early that the sun had not yet come up, and I remember looking up at the ceiling, which to a five year old seemed so incredibly high, like the domed ceiling of a cathedral, and I remember a teacher ushering us all toward our classrooms. As I walked, staring up at the ceiling and thinking of how I missed being at home and being with my mom, I was thinking about how I’d recently learned that school lasts for twelve years. Twelve years was an incomprehensibly long time, and it seemed to stretch out forever before me. And I decided then and there that I hated school, that I didn’t want to be there, and that I just couldn’t wait until it was over so I could stay at home where I was happy. After all why did I need to come to this stupid school for seven hours a day, five days out of the week? And honestly, that feeling never left me. I was a very smart child so I had good grades up until middle school, when things began to actually challenge me, and my response was to simply give up and slide by on terrible grades until I ultimately graduated high school. I could have applied myself and been an outstanding student, but the truth is I didn’t want to be an outstanding student: I just wanted to go home. I always just wanted to go home. And when school was over and the time for me to start working jobs, it was exactly the same feeling: why am I spending eight hours of the day here, every day, wasting precious moments of my life in a place where I’m unhappy? Why does ANYONE do this? There are so many better things I could be doing with my time. If this is what work is, then I don’t care about work at all, and I don’t want to do it. And, like school, it’s never really left me, that feeling of the utter uselessness of going to work. I can understand on some level why it’s important to go out and be a member of society, but the fact that in addition to that simple childlike desire to go home, I now as an adult have to contend with debilitating social anxiety and panic attacks, makes it even harder to go to work on a regular basis. And so, it’s always been difficult for me, and probably always will be. I started this new job incredibly excited about working for this company, but within a few weeks I’ve already called out about four or five times and left work early twice, and that doesn’t look good on me. So here I was, at work, with an upset stomach, just trying to make it through the day. My vision started to get blurry and I began to feel more and more disoriented. I had made a decision the night before that I was going to start eating healthier, so this morning had NOT included a run through the McDonald’s drive through for a sausage, egg and cheese biscuit, and instead I’d eaten my protein box with two eggs and some fruit, and later the turkey sandwich from another protein box, and even writing about either of those things right now is making me want to throw up, so you can see where this is going. I felt shaky and weak, which are symptoms that, along with the disorientation, I’m very used to, because they’re common signs of anxiety attacks, and also signs of low blood sugar. I didn’t feel particularly anxious, and when I checked my sugar it was lower than it should be, so I decided I would take lunch soon and have something sweet. On lunch I got a frappucinno (yes, I’m diabetic, and yes, I got a frappucinno, I didn’t say it was a GOOD decision) and a pre-made panini and went to sit in my car and eat and try to recover. After about ten or fifteen minutes I could feel my sugar rising and started to feel a bit better, when I suddenly realized that the air condition in my car was bothering me, so I turned it off. But when I turned it off I realized that actually, I was freezing, so I turned the heat on. All the way. And blasted it. I was suddenly freezing, cold chills running up and down my whole body, and the heat felt like a warm blanket; my skin was covered in goosebumps, and I was reminded of the time I got bronchitis, which began with a terrible fever, when I’d sat in my truck with the heat blasting for a good fifteen minutes before I got out, and then discovered the next day I had a high fever. This was so unexpected and sudden that I wasn’t sure what to make of it, but my break was nearly over. The 30-minute mark of my break came and went, and I stayed in the car, shivering, and trying to breathe. Eventually about 45 minutes had past. I knew I wasn’t going back inside. I gathered up the courage to call the store and let my manager know what was happening, and that I was going to go to the Emergency Room. When I got to the Emergency Room, I brought in a small blanket my sister had made by cutting and tying together two pieces of fabric. I was surprised to find that I was NOT running a fever, despite having every symptom of a fever. This led to the longest night in the Emergency Room I’ve ever experienced. I got there at 8PM. I was taken back, had blood taken from me, and hooked up to an IV pole with saline dripping. I kept going back and forth to the bathroom with dhiarrea like I had all day. I was taken to a room and given a gown, and the nurse even brought me a heated blanket. 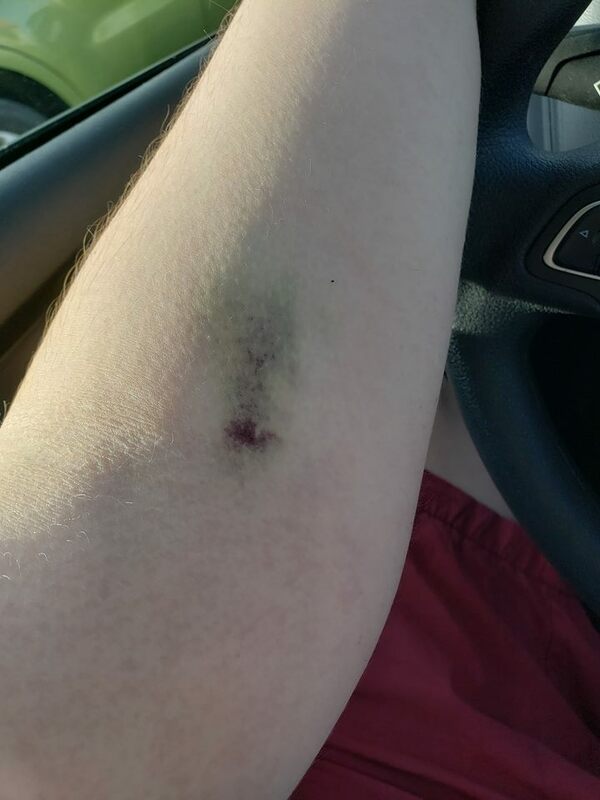 I did NOT like having an IV in my arm, as I don’t do well with needles, and an IV isn’t a needle, but a gauged tube that holds your vein open so that fluids can be injected directly into it, which somehow made my skin crawl even more. The tests were coming back not showing anything serious, my white blood cells were normal, my symptoms seemed to be an elevated heart rate, severe dehydration, and slightly heightened liver function. An ultrasound was taken of my liver and I was eventually given an X-Ray for one of my ribs which had recently been bruised, just in case it had something to do with what was going on. I was continually amazed that I was NOT running a fever, despite laying their shivering under what was now a pile of FOUR blankets: my sister’s quilted one and three from the ER. The fluids were making me even colder. Hours were passing. I was so exhausted, and just laying there and breathing was becoming more difficult. The heart monitor kept making annoying beeping sounds because my heart rate kept hitting 120, which is not dangerously high but is too high to be considered normal. I was so afraid that at one point I took my phone out and turned on the voice recorder and set it on my chest and made a spoken Last Will and Testament, just in case it turned out to be needed. I told my lover and my best friend Jake how important he is to me, and that I leave everything to him, and said some words about people in my life who’ve been important: my ex-boyfriend Nathan, my friends Zack and Robert who I used to live with, and a handful of others. I said that I didn’t want a Christian funeral, and I didn’t want any preacher to use my death or the grief of my friends and family to prey on them with a funeral service inciting them to come to Jesus. I chose a few songs that I wanted played at my funeral. I know this all sounds dramatic, and I was aware at the time that it was a silly thing to do, but at the same time… I just DIDN’T KNOW what was happening. All of the tests they’d run seemed to indicate that I was alright aside from dehydration, and despite having fever symptoms, I wasn’t running a fever. Did that mean that I was suffering from something really rare and unusual? Was I having a reaction to something that they hadn’t figured out yet? I certainly felt like I was dying, so was I actually going to? Sadly I didn’t get to finish what I was saying to Jake in my recording because someone came into my room. Eventually I fell asleep. I woke up covered in sweat, no longer freezing. I felt a lot better already. My vitals were all the same as before: still a high heart rate, my temperature was elevated but not technically a fever. By now it was 1AM. I was lonesome, I was afraid, I was sad. I called every member of my family and none of them answered. My phone was at about 10% and had another hour or so before it died, and I didn’t have a charger for it. One of my friends, Tori, gave me a call, I’d never heard her voice before, but it was nice to hear someone friendly. She assured me over and over again that I was safe, that I was probably fine. It helped a lot, she was the first person to offer me any kind of comfort. Blood cultures were taken and it was incredibly painful. My veins wouldn’t show up because I was dehydrated and it took three attempts, rooting around inside my veins with the needle, each time my heart pounded as I squinted my eyes shut and tried to breathe. I was told once again that they couldn’t find anything wrong, I learned I have a gall stone but it’s really not a big deal and probably had nothing to do with me being sick now. The doctor finally let me take the damn temperature myself, rectally, and yes I did in fact have fever. Strange though considering I wasn’t freezing cold anymore. Around 4AM I started to get antsy, I was ready to leave soon, but then I was told I was going to be transferred to a hospital for observation because my heart rate was too high. I was honestly just not interested in doing that, but they suggested I take in another bag of IV fluids since the last one had helped so much and see how I was doing after. That sounded reasonable enough, except after an hour and a half, the fluids were still not any more than halfway through the bag, and I didn’t feel much different than I had before. And what’s more, I did NOT want to go to the hospital and suffer through any more of this. Finally I told my nurse I was thinking of leaving soon, and she said I’d have to sign papers saying that I was leaving against the doctor’s recommendation, and indeed that’s the only paperwork I was given: a pink copy of a sheet saying that I acknowledged that the results of my refusing treatment could be (and then a blank space in which was written very simply) “sepsis, death.” I still don’t know what sepsis is and don’t want to. I waited and waited for my nurse to come back and take my IV out, but now she was helping other people and cleaning another room, and I was nearly ready to march up to the counter and offer them an ultimatum that either someone take this IV out of me or I’m doing it myself and it’s going to be a mess, before finally at 6AM, I was released from the machines I’d been hooked up to and my vein was finally, after ten hours, closed. The moment I walked outside and smelled the damp morning air from the rain that had fallen overnight, it was like I’d just been reborn. It felt incredible. I was reminded of a moment in Dragon Age Inquisition where Cassandra describes her vigil to become a seeker, where she’d kept in dark and solitude, fasting and praying for days on end, drained of all emotion, until finally being touched by a spirit of faith and let out into the world again, and that the feeling is indescribable. I honestly wondered if maybe I HAD died in the hospital, and this was me in another universe where I’d survived, living out the dead Jesse’s wish to see the outside again. Driving home in my car was a wonderful feeling, and as I got inside and crawled into bed, I hoped that the worst of it was over. I was wrong, of course, but I’d made it through the experience at the ER. The next day was difficult, filled with just as much emotional trauma as the last. I felt like I was dying, like I’d never be back to normal, never have my life back. I couldn’t move, I couldn’t eat, I could sometimes barely even speak, and I was so tired at all times. When I slept, I sweated profusely. The only things that made me feel any spark of joy were watching the animals in our house: several cats and two dogs, as they went about begging for food or following people around. My dog Butterscotch stood watch nearby wherever I was resting. I felt better as I got into bed that night, and the next morning awoke more tired and afraid than I’d been yet, and a hurricane was preparing to come through our area. Later that day I felt better, and it continued to go in waves: a little better, then terrible, then a little better, then terrible. No one at the Emergency Room had offered me a concrete answer as to what was wrong with me, but my symptoms perfectly matched that of food poisoning. Tori called me again and reassured me that I was doing great, that I would recover soon, and that it took her husband three days to get better from food poisoning. Everyone kept saying three days, actually, that was apparently the magic number. On the third day, I was out of the woods. I was not recovered or even nearly back to normal. It is the fifth day now and I’m still not back to normal, but I knew that the worst was now over. And I was greeted by another surprise when I woke up: autumn. Every year I look forward to autumn, because the choking heat of summer makes me feel like I can’t breathe, and the fresh breath of autumn is like water when I’ve been choking and thirsty for months on end. 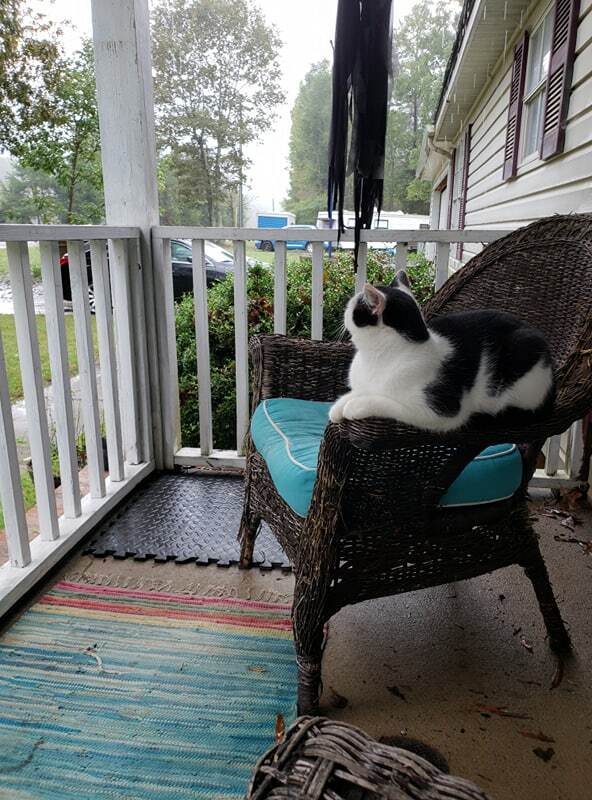 I stepped onto the front porch and smelled fall air for the first time in a year, and it was as though nature was congratulating me on making it through, and I had the feeling that my life before the sickness and my life after were probably not going to be the same. I don’t really know, honestly. I have a lot more to talk about, but it’s getting late and I’ve written all I can. Tomorrow I’ll talk about what’s been happening in my mind this whole time, and where my thoughts are, and what my plans are. Going back to work… it’s something I still haven’t done yet. I don’t know if I’ll lose my job over this. I don’t know what’s going to happen next. I am scared. But I’m going to just keep going and doing what I have to. Right now, I can’t afford to do anything other than exactly what will help me recover. Yesterday there was a fire in the front yard, and they burned limbs and wood all day. 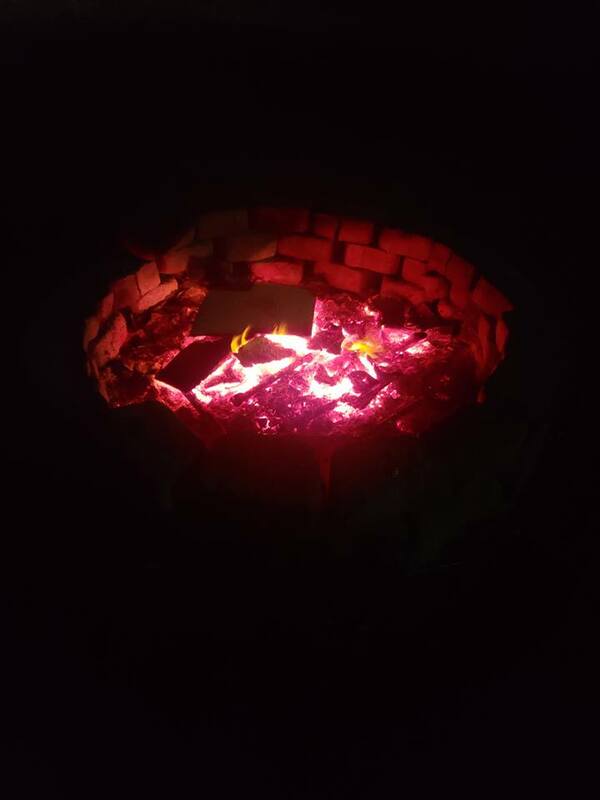 At night I took this picture of the smoking embers as I stood by the remaining warmth. It felt like it was really fall. And as I found myself standing up, outside, and walking around, I felt like a different person than the one who’d been suffering these past fews days, like I was his representative, strong and determined, sent out here to speak on his behalf. And I couldn’t help wondering, again, if maybe I HAD died of the sickness, and this was some universe where I’d escaped that fate, or history had been changed to allow me to live somehow. I didn’t feel entirely the same. And with the seasons changing, I knew that one of my biggest sources of fear and anxiety, namely the heat and the environment, was going to be far away for a while. I felt hopeful, and yet still terrified at the same time. And I still do. But I’m alive, I’m alive.